It seems like every year about this time of year I find myself talking about Gerald Welch’s wonderful novel series, The Last Witness. Earlier this year, they released the first collection of The Last Witness, and I was fortunate enough to get a copy. The Last Witness is an alien prince named Shiloh. He is sent to Earth at a young age when his older brother stages a coup taking over the planet and killing their father. Shiloh doesn’t remember his home world of Ehrets, all he knows is that he has been sickly most of his live. The alien computer Mattis sent to monitor him ends up triggering his abilities as “The Witness.” Unfortunately, this awakening has put Shiloh in the crosshairs of threats on both Ehrets and on Earth. What makes The Last Witness work is that it seamlessly blends teen drama, superheroes, aliens, and religion into one brilliant serialized narrative. This Omnibus has a lot of content! You get the first two books of the series, The Arterran Chronicles and Resurrected Destiny. You also get a Welch’s War in Heaven, which is a real brilliantly done version of the war between Lucifer and God. In a lot of ways, I think that work may be his masterpiece. And it serves as a great launching point for The Last Witness. One of the things I love most about this series is all the world-building Gerald Welch does, and you get to see his talent for this on full display throughout this Omnibus. 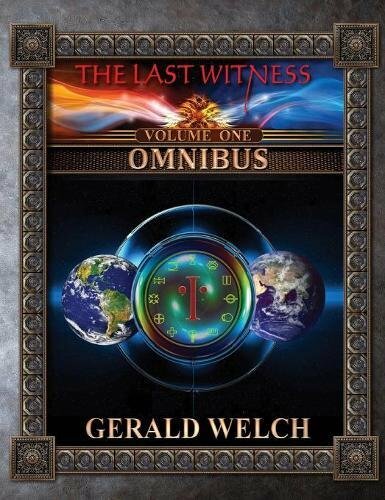 The Last Witness Omnibus comes with an extended version of the source material from the print version of The Arterran Chronicles, including maps, character biographies, a lot of sketches and detailed breakdowns of the characters and technology used in the book, even some information about how the Arterran language came about. This omnibus also has a great interview with Welch about the origins of the series and his plans for the series moving forward. Really this is the perfect holiday gift for a fan of The Last Witness or Welch’s other work, including Legacy, which is a spinoff of Warren Murphy’s Destroyer series. But even if you don’t know Welch’s work, I would still highly recommend checking this one out! I am looking forward to more of this series done in this format! Also keep an eye out because Welch will be releasing a Legacy Omnibus soon as well! BTW, you can pick up the first ebook in the series “Resurrected Destiny” FOR FREE starting tomorrow until Dec 1! !